Nacin has introduced some lovely changes to core trac. It would be fantastic to have the same functionality on meta trac. I'm particularly thinking about the ability to star and follow tickets, but also the duplicate ticket suggestions and the nice box that mentions that someone is opening their first ticket. In relation to this - the CC functionality seems to have disappeared on meta trac, but it hasn't been replaced by the follow functionality so there's currently no way to follow a ticket. Notifications will be ported to meta/bbpress/buddypress tracs soon, we're just trying to make sure the MySQL server we set up for core trac can support it under its current config. With that comes the newbie notices. Duplicate ticket suggestions are separate. They're not difficult to add elsewhere, but they are pretty low quality at the moment. I have *no* idea where CC went. Will try to bring that back for the moment. That all sounds great. I was mostly after the CC functionality - if you could bring that back that would be awesome for now. Brought CC back. No idea where it went, but it's here now. 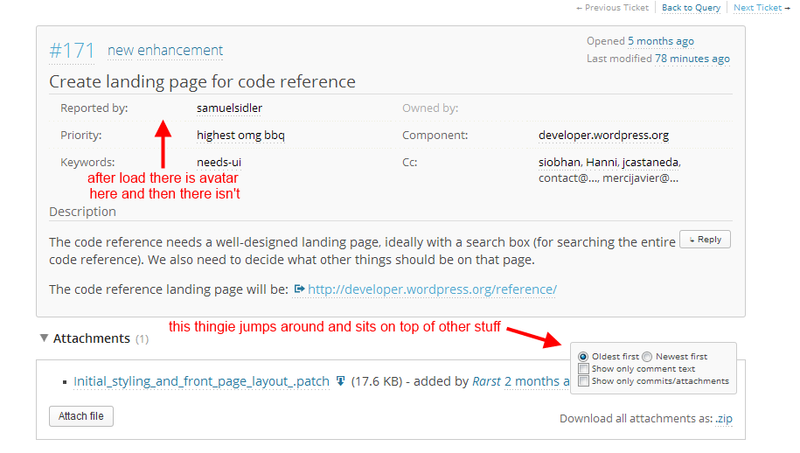 General FYI, almost every other new piece of functionality was brought to other Tracs: ​http://make.wordpress.org/meta/2014/01/15/trac-updates/. #301 was marked as a duplicate. This ticket was mentioned in ​Slack in #core-flow by sam. ​View the logs. #1301 was marked as a duplicate. CC is there for me right now. Prepare Trac subscriptions to be enabled on meta.trac. see #291. Enable Trac subscriptions for meta.trac. see #291. Reports that let you see your favorites, etc. Note I plan to do this for additional Tracs too, now that a conversion to MySQL is no longer required. We kind of have them (see ​our team page), but I don't think we need something that formal. This ticket was mentioned in ​Slack in #buddypress by netweb. ​View the logs. @nacin Is there much left to do to bring these changes to the bb's? This ticket was mentioned in ​Slack in #polyglots-events by netweb. ​View the logs.